Resembling a mini-Cheetah, the Singapura sports oversized, almond-shaped eyes, a tabby “M” on the forehead, petite round-shaped face and a blunt nose. Its small stature is muscular and feels heavier than it looks. Blessed with a low-maintenance, brown-ticked coat, the Singapura simply needs a monthly wipe down using a damp washcloth to keep its coat looking its best. It does not have an undercoat. The coat comes only in sepia (dark brown), with ticked fur and is short, sleek and silky. Females weigh between 4 and 6 pounds and males average between 6 and 8 pounds. Affectionately known as “Velcro cats” because of their intense desire to always be with their chosen people. They love laps as equally as they do playing interactive games. Also likes to paw faces to wake people up in the morning. Does best in active households that include other pets to keep them company while you’re away at work. Extremely curious, engaging and talkative. Never seem to run out of energy or slow down and will always try to insist on helping you with a project. Definitely enjoys greeting houseguests and thrives in an active household. Keep tabs on this small cat because it can slip out of a door quickly. Always fit your cat with a collar identification tag as well as microchipped ID. Benefits by being provided sturdy, tall cat trees to climb and survey the scene. Due to their petite size and oversized curiosity, the Singapura can easily find a small hiding spot, so pet-proof your home before bringing home this cat. Despite its small size, the Singapura surprisingly gives off a lot of heat and can feel like a satiny heating pad when on your lap. Born in the streets of Singapore, this breed’s official beginnings remain shrouded in mystery. Hal and Tommy Meadow of California brought the first four Singapuras to the United States in 1975 after moving back here from living in Singapore. 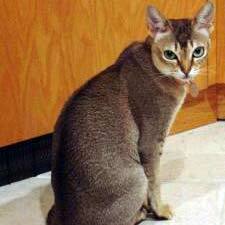 Tommy was a top cat breeder of Abyssinians, Burmese and Siamese and an all-breed judge who worked hard with her husband, Hal to promote the Singapura breed in North America. The Singapura is touted as a tourism mascot in Singapore and sculptures of this breed can be found along the Singapore River. Today, this rare breed is ranked 32nd in popularity among the 41 breeds listed by the Cat Fanciers Association, which granted it championship status in 1988.